Hey there folks! 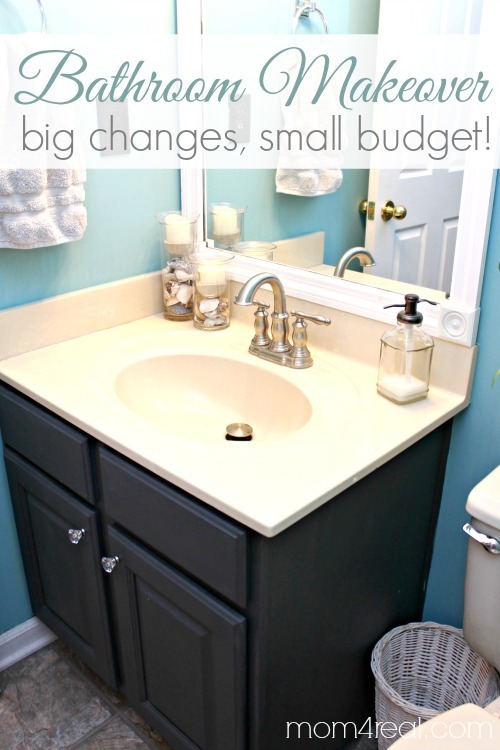 I originally shared my Budget Bathroom Makeover at the SNAP! blog, but thought I would share the deets here just in case you missed it! 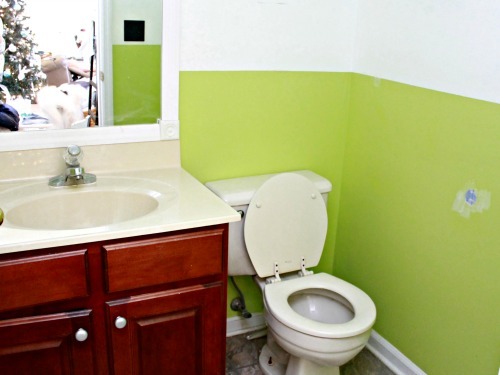 The original makeover of this bathroom was a sort of fail. That means that some things worked, and some things did not. The baby food pea color on the walls did not work. The big white stripe around the room was not even, which was totally my fault for not using a level. That’s how I used to roll though…never taking time, just hurrying through a project, half arsing it. Lucky for you, I learned some lessons that may save you from making the same mistakes. 1. Never paint a room pea green…just don’t…it never works. 2. When painting stripes on a wall, do not wing it. USE A LEVEL! 3. Adding new knobs to ugly cabinets will not make them pretty. It just won’t. Putting a dress on a baboon may have the same result…not good. Start by painting the walls. If you don’t have the budget for anything else, painting will make all the difference. *** Cheap Tip *** Look in the Oops section of your home improvement store of choice. It’s right behind the paint counter. There are usually gallons of paint for $5 there that they have mixed for other customers that the customers didn’t buy for some reason. There is absolutely nothing wrong with these paints, the customer usually just changes there mind, and because it is already mixed, the stores have to offer a heavy discount on them. 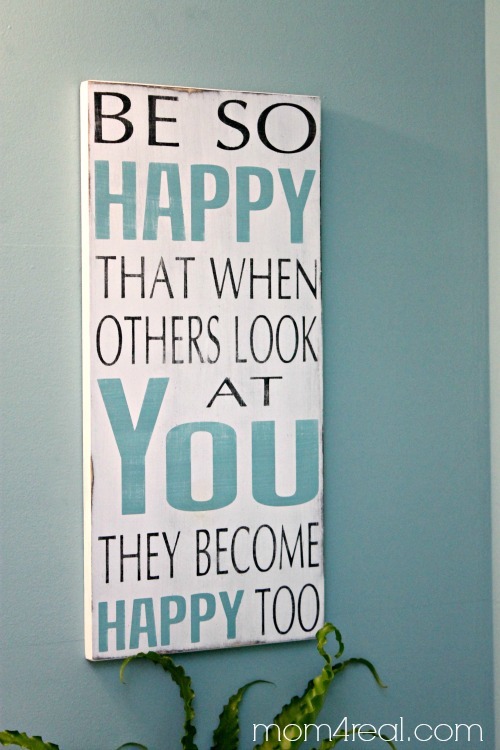 Next, frame out your builder’s grade mirrors. You can find the full tutorial along with the before and afters, HERE! You need no tools, just a few supplies, and for a typical 1/2 bath, it will cost around $25. 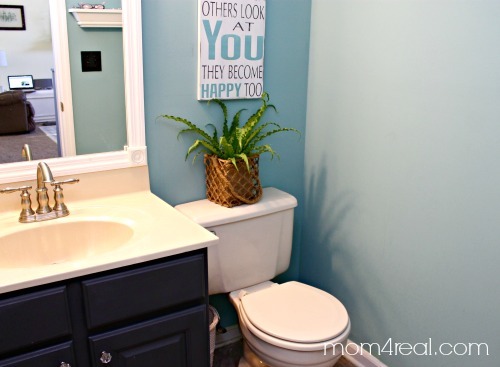 It made a HUGE difference, and gave our bathroom a more custom look instantly. Change out your faucet. I dreaded this! 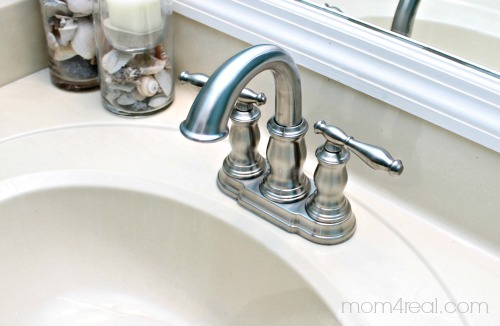 I thought changing out a faucet was a major pain, but honestly, it ended up being one of the easiest things ever! Took me less than 30 minutes, and I was talking to my friend Shannon from Fox Hollow Cottage while I was installing it. Out with that old nasty mildew under the middle that you can’t get rid of faucet, and in with the new beautiful faucet…yay! A faucet can cost you anywhere between $25 and $300 depending on your taste. Honestly, most of them look the same to me, and there are a ton of beautiful options for less than $50 at Home Depot. Paint your vanity. 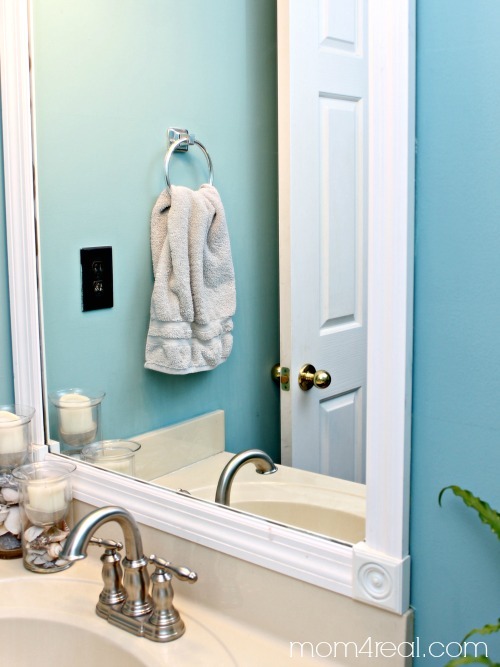 If you don’t like the look of the vanity in your bathroom, no big…paint it! I used Americana Decor Chalky Finish Paint that you can buy online at Home Depot because you don’t have to prime the surface first to get it to stick. I chose a dark grey color, then finished it off with creme wax in the same brand. It won’t scratch and it covers perfectly! If you don’t want to purchase that paint, you can prime the vanity, then buy a couple paint samples in your desired color…two samples will allow you to paint a couple different coats for way cheap! Add some pretty knobs! I am obsessed with glass knobs, but for this room (since I was on a major budget), I bought a couple of faux glass knobs at Walmart for around $3.50. They look great too…don’t ya think? To finish off, add a few fun details like a plant, some fun subway art, a pretty soap decanter and maybe some candles! It’s that simple! You can make one change, a few changes or change the entire room depending on how much you can spend. You don’t have to do it all at once like I did. Start with paint and do one thing at a time. Rome wasn’t built in a day, right? So…what do you think? Are you ready to make some changes in your bathroom? I’d love to hear all about it! Oh Jess! It’s not baby food pea green anymore! It looks so pretty. I like the understated accessories too. The ore you have, the more you have to move to clean. It looks perfect! Now come put in the faucet I’ve had for oh, about 4 years now? I love the bathroom color and how beautiful it looks now. Can you tell me where you got the subway art? I love the saying. I’d love to know where that subway art is from. It’s perfect for my bathroom too. Did you make it? I love your bathroom’s new look! My bathroom looks very similar to your original (but with a tub on the other side of the toilet), so this was VERY inspiring! I have one question about your vanity paint, though. I was thinking of using that brand on my kitchen table. Did you sand your surface at all before painting? Would you recommend I sand and/or prime before painting a table with it? Thanks for the tips! Definitely pinning this! I was wondering if you could give more detail about the paint you used. How many layers of the chalky finish did you have to use? also, did you use a clear creme wax? Yes, thank you. I was wondering if you have ever used this paint on larger space, such as walls? Love this! Our small bathroom is in DESPERATE need of a makeover!!! We are on a seriously small budget as well but with old brown cabinets, a black shelf above the toilet, a blue bathtub/shower and blue sink, our poor bathroom is hideous! lol These are great tips! Thank you! Home Depot sells the chalky paint in 8oz and 16oz sizes. Can you tell me how much you purchased/size? My vanity is about the same size it looks like. Thank you! Can you tell me what color paint your walls are? Thanks!